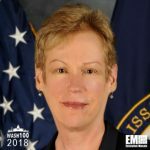 Betty Sapp, director of the National Reconnaissance Office, has said she expects NRO to assume responsibility over a commercial satellite imagery acquisition program currently assigned to the National Geospatial Intelligence Agency in September, SpaceNews reported Tuesday. She told the publication both agencies work to ensure a smooth transition of the EnhancedView contract management process. “We see a real opportunity for synergy in operations, acquisition and delivery timelines,” said Sapp, a 2018 Wash100 recipient. NGA has used the contract to help government customers procure high-resolution satellite imagery products intended for national security and disaster response missions, among other applications. Sapp added that NRO aims to build technology platforms for agency personnel to collect and exchange space-based intelligence data with other intelligence and military agencies.